With the development of digital and creative software, drawing has increasingly been taking a backseat in the architectural design process. Eye Line, an annual architectural drawing competition run by RIBAJ Magazine in collaboration with AVR London, celebrates the art of drawing in architecture by providing a platform for both established and training architects to draw real or unimagined buildings. Matthew Kernan, an Irish Part II Architect from Armagh, Northern Ireland, was announced as the Eye Line 1st place winner on the 1st of August 2017. He took our breaths away with his winning pieces ‘Locus Amoenus’ (pictured above) and ‘Fragmenting Nostalgia.’ The beauty and skill of these pieces were beyond dispute. Touching in the simplicity of their off-centre compositions, yet deeply profound in the smallest details, it was obvious to the judges that these were outstanding pieces. A recently graduated part II Architect from Queen’s University Belfast, Kernan is a previous employee of Foster + Partners, London and Clancy Moore, based in Dublin. Matthew recently took a moment to answer our questions about how his winning pieces came to fruition. AVR London: What made you decide to apply to Eye Line and how important do you think these competitions are for both training and established architects? Matthew Kernan: I’ve been following Eye Line competition since it first started and have always enjoyed looking through the entries. I had always felt my drawings were much quieter in a sense to what typically prevails as the stronger entries, but this year I just felt like going for it and thankfully, in the end, there was something special about the ordinariness I wished to portray. I think these competitions are excellent for all involved in architecture, it helps widen the visual discourse we can create in how we can portray the thoughts in our minds as designers. AVR London: Did your winning images come from a specific project? 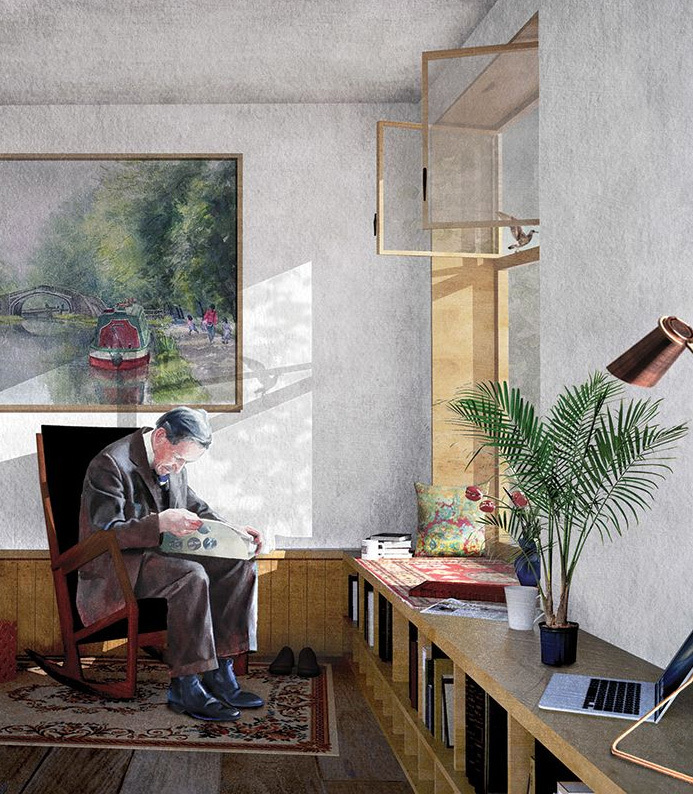 Matthew Kernan: Yes, my Fragmenting Nostalgia image came from my MArch Year I project of Economy housing in Aarhus and my Locus Amoenus Image came from my MArch Year II thesis project which was based along the Hertford Union Canal in East London. AVR London: Can you explain a bit more in depth the processes behind creating these two images? Did you start off by sketching out the composition? Were the images for the most part hand drawn or was there a large amount of digital input? Matthew Kernan: I come up with all images/scenes by story boarding. This will help me constrain the best selection of visuals to get the most sincere feeling of the project across. The process will come about by sketching various views/ early concepts of the projects to see where it is going and then further sketch refining from there. Once I come to a stage that I am happy with, I will then 3D model each scene and take it from there. Typically, I already have the composition of the view in my head before I even get to this stage. Rendering machines are used to get the base tones of each visual. However, I prefer to refine each texture and layer on photoshop. For me, this is when it becomes more of an art, more authentic to the owner. I prefer not to let the render machine determine the outcome of the visual but rather my ability to carefully select, manipulate and create the atmosphere of the image. AVR London: With the release and subsequent popularization of Computer Aided Design programs since the early 1980s, the role of drawing in architectural design has been under siege and has become a topic of heated discussion. Eye Line competition aims to celebrate the art of drawing in architecture. How important a role do you think it plays in the creative process of architectural design and has it featured prominently in your work as a student? Matthew Kernan: For me, it is impossible to get a truly authentic piece of work in architecture without first sketching the idea of which you wish to achieve. During the process of my own projects, I will accumulate stacks of tracing overlays that provide the basis of all of my designs. It is often that I simply draw myself out of problems that I come across, it is a much more fluent process than working solely through a machine. Fortunately, there is a culture within Queen’s that when submitting portfolios and throughout tutorials, we must show how we come to structure our ideas through hand sketching and sketch models. So it’s something that was very prominent in my education. AVR London: Were there any formative experiences in your childhood or adolescence which inspired you to choose architecture as a career, eg. studying art at school, sketching buildings, crafting models? Matthew Kernan: From as long back as I can remember, I had always felt an incline to step into the world of architecture. Unfortunately, there isn’t one romantic moment in which I knew that it was the profession I must follow into, but perhaps that in its own sense is where the romance lies, the idea was always there, that it was what I wanted to do. AVR London: Is it common for you to use literary sources as inspiration in your design work and why does James Joyce’s ‘epiphany’ hold a particular resonance? Has his work acted as a longstanding inspiration for you? Matthew Kernan: Joyce’s work was always interesting to me and when I was searching for my thesis site within London at the beginning for the year it was one of the first things that had come into my head. The unit that I was in for my Masters encouraged weekly readings in order for us to broaden our scope and understanding of the subject. Truly great architecture is powerfully emotive and compelling and what I aim to do is bridge the words with the image to capture the very essence of each project. 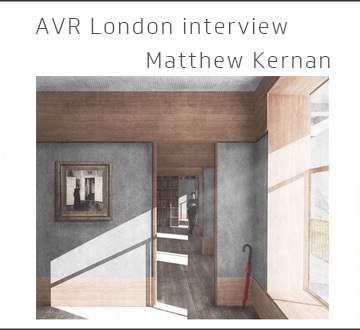 Matthew Kernan: I had spent hours searching through different paintings and references to find a suitable figure to use for this particular image. Hockney’s father depicted the correct demographic I wished to portray in this scene and also provided the perfect angle. I had gone through several different figures in the image before using him. When he was placed in the image, I felt the tranquillity that I was searching for. It was the final piece added to the image. AVR London: Were there particular reasons for making the two compositions off-centre – Was this symbolic of anything? Matthew Kernan: There is something in the subtle nuances of asymmetry that I find to be compelling when achieved with the correct balance. It is what felt most natural for these images to achieve my desired effect and it was an underlying theme in the references that I had been learning from. AVR London: In ‘Locus Amoenus,’ the judges’ assumption was that the bird at the window taking flight was ‘frozen on the cusp of flight, past and future intimated in the present.’ Would you agree with this statement or are there other symbolic reasons for this choice of detail? Matthew Kernan: Absolutely. The placing of the bird with the wings outstretched, the windows open, the light hitting against the wall, Hockney’s dad – these are all very carefully considered details to portray the ‘epiphany’ moment that Joyce described. The idea of past and future in the present are these very notions of a trivial incident. AVR London: There are some beautifully haunting details in Fragmenting Nostalgia – the figure in the far background, the umbrella in the forefront corner, and the choice of Woman in Black as the subject in the wall painting. Can you describe what might have inspired these subject choices and their physical arrangementwithin the composition? 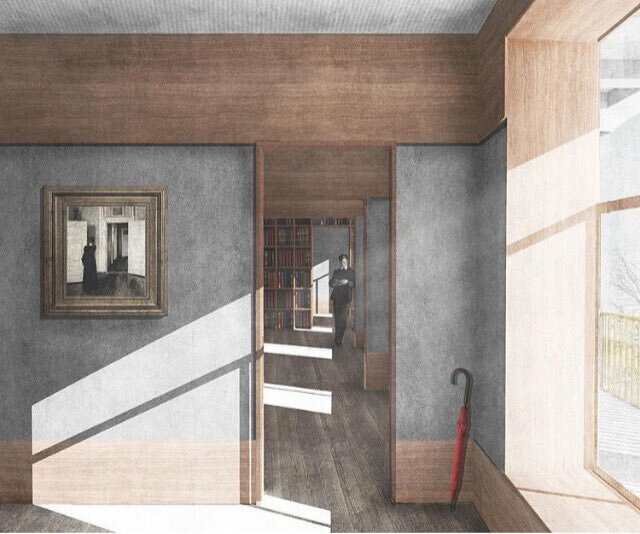 Matthew Kernan: This was the culmination of a year’s work, research, and design for a Masters project that was focused on the arrangement of enfilade and datums. I had been learning from projects and art pieces that were being used as references through out the year and by the time it came to completing this interior image, the composition was completed subconsciously as a result of everything that I had built up. Sometimes, it is possible for the composition of each element to form naturally. You have to trust your first instinct rather than forcing, and this is what happened when I was forming this image. The title ‘Fragmenting Nostalgia’ hints at the notion that there will be something familiar when you first look at the image. AVR London: Finally, are there any particular paths in the industry which you might want to pursue – particular types of architectural firms who emulate a certain type of house style? Matthew Kernan: I have just finished my Master degree so I am planning on taking a year now to do a bit of travelling after a few intense years. After finishing my Part I, I spent 2 years in London working at Foster + Partners and went straight back into Masters without any break, so I’m going to take a bit of time to reflect on where I wish to position myself. I was very fortunate to have had Andrew Clancy, Colm Moore & Tom O’Brien tutor me over my MArch and I believe they helped fine tune what I was interested in most and got to spend a summer working for them in Dublin, so I have experience at both ends of the spectrum to gauge from. Either way, I wish to pursue a style of architecture that has an evident sense of habitual gregariousness, that gives back more to people than what it takes. So this will be my main consideration when I return.